Switch needles to 4.5 mm needles and work 5 rows in stocking stitch. Knit 19 stitches increase 1 stitch knit 2 increase 1 stitch and knit to the end of the row. Purl next row. Stitch markers can be used to indicate where the increase stitches are. Continue to increase until 14 stitches are increased. 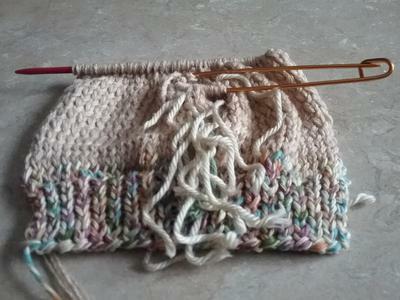 Take off the 14 middle stitches and put on a stitch holder. Knit 19 stitches increase 1 stitch knit 2 stitches increase 1 stitch knit to the end of row 40 stitches on needle. Purl next row. Continue in stocking stitch until mitt covers hand then decrease. Knit 2 together (k2tog) across row . Next row purl. Continue in this manner until there are no stitches left on needle. 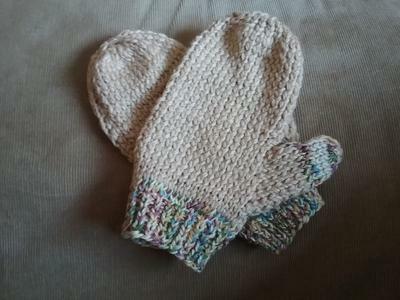 Knit the second mitt to match.